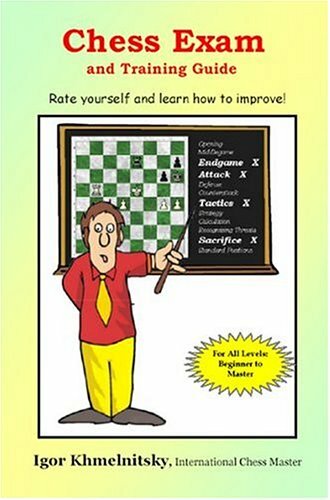 This book offers a unique approach to chess self-evaluation and training. It will answer the two most common questions that players ask an experienced coach - what is my true rating (or strengths and weaknesses)? How do I improve? 100 diagrams & 200 total questions of various difficulty. Comprehensive answers include diagrams for easy reading away from the chessboard. Distributions of answers, percentiles and other statistical reports by rating group from unrated to 2400+. Match yourself against players of all levels, up to grandmaster and see how you stock up. Results evaluated and Rating assigned overall & by 12 distinct categories: Opening, Middlegame, Endgame, Attack, Defense, Counterattack, Tactics, Strategy, Calculations, Standard Positions (Endgame), Sacrifices, Recognizing Threats. Comprehensive reports on each of the categories with examples, training recommendations and book/materials suggestions.